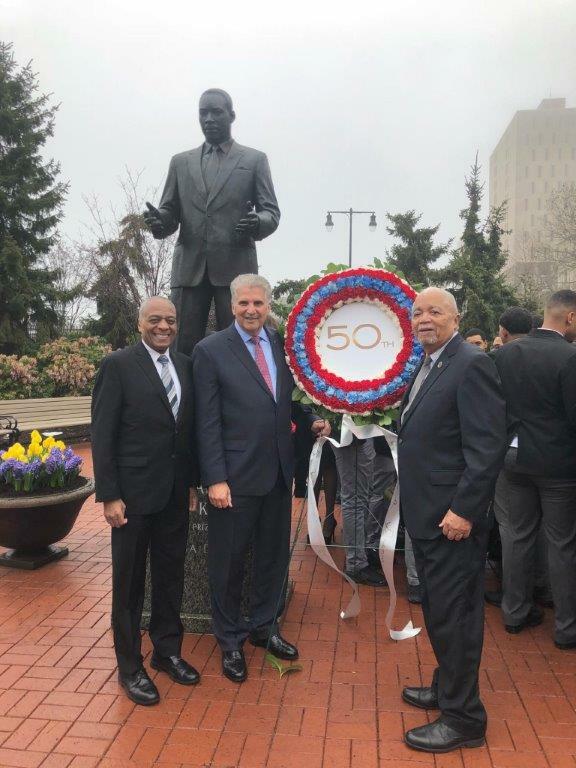 Newark, NJ – Essex County Executive Joseph N. DiVincenzo, Jr. hosted a ceremony to commemorate the 50th anniversary of the assassination of Dr. Martin Luther King, Jr. on Wednesday, April 4th. “Dr. King was one of our nation’s greatest leaders and one of his last public appearances was his visit to Newark, just a week before he was taken from us,” DiVincenzo said. “His message of hope, peace and equality has resonated throughout the decades and inspired generations – and is just as poignant and relevant today as it was in 1968. Remembering his contributions and laying a wreath at the Dr. Martin Luther King, Jr. Statue in front of the Essex County Hall of Records is a fitting tribute to an individual whose guidance and foresight impacted our nation,” he added. Along with the County Executive, elected officials, community leaders and students from the Essex County Newark Tech Campus shared what Dr. King means to them. “I am a little conflicted because today is the anniversary of Dr. King’s death. But this is an opportunity to take back the negativity and celebrate a life that was taken away from us too early,” NJ State Senator and Deputy Chief of Staff Teresa Ruiz said. “Dr. King taught us that our fight for justice has to be stronger than our enemies’ anger,” Newark Mayor Ras Baraka said. “Today we are commemorating his assassination, but we are also celebrating the sacrifice he made for all of us,” he added. Deputy Chief of Staff William Payne talked about the various times he met Dr. King when the minister visited Newark. “I saw him at an event at Abyssinian Church in Newark and said ‘I’ll see you next time’ as he was leaving. The next time I saw him was at his funeral,” Payne said. “Dr. King’s legacy needs to be known and understood by everyone, because we all have an obligation to continue his work,” he added. “I thank Dr. King for challenging the structure of our society and speaking about eradicating poverty, racism and war,” said Larry Hamm, President of the Peoples Organization for Progress. “I am proud to be a resident of Essex County because I can stand next to his statue in this county complex. I am proud because Essex County is the only place where there are larger than life-sized statues of Dr. King and Rosa Parks,” he added. “Dr. King talked about the promised land and reaching the mountain top, but we’re still not there yet. There is still a lot of work to be done. But the guidance Dr. King gave are just as valid today as it was 50 years ago,” Freeholder Vice President Wayne Richardson said. “Dr. King was killed by a man who used an alias to purchase a gun. Can you imagine what he would say about society today. There is much more we have to do to make his dreams become reality,” Freeholder Patricia Sebold said. “Dr. King has taught me to be a dreamer, an activist, and to dare to be someone who thinks outside the box. While there are still great strides to be made in our country regarding race relations, I believe his message for my generation should transcend to other areas, including gender equality, religious tolerance, LGBT advocacy, immigration, and gun control… Collectively, we seek to create a world where man or woman, regardless of race, religion or sexual orientation, can be viewed and respected as an equal,” Newark Tech senior Abbey Lawrence said. “Today, April 4th, we honor Dr. King once again for the love he gave, the ideas and visions he bestowed upon us, and the sacrifices he made to ensure that we live a life in which we are free. But the journey does not end there. It is essential that we finish where he left off. Dr. Martin Luther King Jr.’s motive was and still is to grow with love, encourage with love, and persist with love,” Newark Tech senior Shania Langford said. “Martin Luther King Jr. was a man whom many individuals looked up to, he was a role model to those who had no hope. He fought for equal pay, attended churches where he inspired minorities to be strong, and even visited schools to help motivate and guide the younger generation. He went ahead and established a civil rights movement that inspired people all around the world. Dr. King empowered communities throughout the country to accomplish what many assumed to be impossible. He fought against the segregation of schools, pushed for equal pay for workers, and lead non-violent resistance to racial injustice,” Newark Tech senior Christian Gomez-Seino said. The Essex County Dr. Martin Luther King, Jr. Statue was dedicated in October 2015.